This Basic Homemade Granola is made on the stove-top, so it's quick and easy to make and it can be customized to your tastes! any add-ins of your choice: nuts seeds, dried fruit, etc. Add the coconut oil to the skillet and let it melt. Toss the rolled oats in the pan and stir them together with the oil until they're coated and the oil appears to have disappeared. Turn the heat to low and toast the oats for about 5 minutes, moving them constantly so they don't burn. Add the cinnamon, honey and vanilla extract and toss everything together well in the skillet, continuing to stir constantly. After stirring for a few minutes, turn the granola out onto a parchment-lined baking sheet to cool to room temperature. Serve the granola as soon as it's cooled, or store it in an airtight container for up to two weeks. If you add dried fruit or nuts, add them right at the end before the granola begins to cool. This will prevent them from hardening too much and creating too-chewy texture. 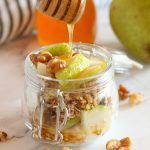 I make a triple batch of this Basic Homemade Granola and it lasts our family for a week of breakfasts!